Yes, you read that correct, over the weekend I attended my 20 year middle school reunion. To be honest I was a bit nervous. Some of these people I went to high school with or am still in contact with today, but some of them I haven't seen in 20 years! The night was so fun! A GIANT thank you to Kelli and Jenni for setting this all up for us! Everyone was so nice and they all looked the same as I remembered them. 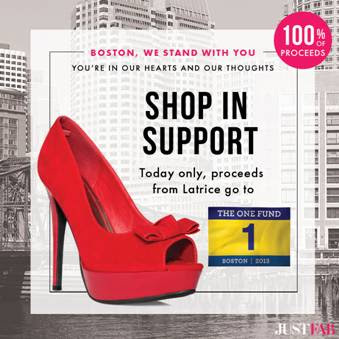 Just Fab stands by Boston! You look great- as always. I bet that was so much fun to be reunited with them! We're also having a giveaway right now if you're interested! Wow, I am not sure where some of my elementary classmates are LOL. What an amazing reunion, and you look fabulous as usual. Love your entire outfit. I love the polka dots and the spiked necklace. Your hair looks so cute with bangs and a side braid. This is an adorable look! Love the dots and bright blue! I came across your blog and am your newest follower. I would love if you’d visit me at : the daily savant : and (if you like) follow with GFC and Blog Lovin'! I have a giveaway on now! super cute outfit, lisa! it is great to see what people look like now and find out what they're doing. i never really plan on going to my reunions, but always end up going!